Widely imitated yet never equaled, claustrophobic thriller Das Boot resurfaces in the definitive Original Uncut Version! 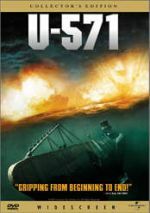 At the height of WWII, a young submarine crew heads out to sea on a top-secret mission that all but ensures most will never make it home alive. Ordered to patrol the Atlantic and destroy an Allied armada bringing supplies to Britain, these raw recruits must band together, bracing themselves against a depth-charge assault from an unseen enemy - can the Captain and his crew summon the strength to escape their watery grave? Oscar-nominated director Wolfgang Petersen's five-hour epic adventure deftly explores tensions as pressure builds to an explosive climax, packing a visceral punch few movies can match. 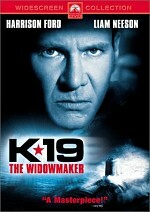 As we hurtle through the sub's cramped quarters, telegraphing not only the controlled chaos of combat but the fearful faces of the U-boat's heroic crew, this adrenaline-rush of a war film still haunts audiences with one final heart-breaking dilemma: would you let others perish so you could survive? Since this represents my third review of Das Boot, I’ll omit my usual coverage of the flick. If you want to read my overall opinion of the film, please head to this link. To summarize, I respect Das Boot because it is well done, but it simply doesn't do much for me. It's a good film, but not one that I particularly enjoyed. That doesn't negate the fact that many others really do like it; I just don't feel the same way. This DVD offers a different version of the flick than the one found on the prior discs, however. Das Boot went through a variety of incarnations over the years. Originally, German audiences saw it as a six-episode miniseries that lasted nearly six hours, but US viewers got a shortened cut that ran about 149 minutes. In the mid-Nineties, we received a significantly expanded “Director’s Cut” that added more than an hour of footage to reach a full three and a half hours. While the Director’s Cut came to be embraced as the better of the two theatrical renditions, for American fans of Das Boot, that German mini-series remained something of a Holy Grail. My Dad loved the movie, and he always pined for the option to see the full take on the subject. With this new DVD, he’ll finally get that chance. 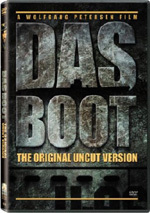 Das Boot – the Original Uncut Version restores all the original material to give us the full-length mini-series. It adds 83 minutes to the Director’s Cut, and at 293 minutes, it almost exactly doubles the original US theatrical version. Given my lukewarm attitude toward the Director’s Cut of Das Boot - the only rendition I ever saw - I can’t say I relished the chance to see the uncut edition. After all, if I thought it seemed only sporadically entertaining at three and a half hours, wouldn’t I become even more bored with an almost five hour version? Logically, yes, but in reality, I thought the uncut version seemed more satisfying than the shorter one. It doesn’t restore any major sequences, so don’t expect gangbusters action or significant excised stories. Instead, it simply expands material from the shorter versions. The film gives us a little more detail about the illicit romance between crewmember Ullmann and his French girlfriend Françoise, and this cut actually shows the star-crossed lovers before he leaves on his trip. Otherwise, the longer version mostly emphasizes the dullness of daily life on the sub. It creates a richer picture of the monotony on the vessel and how crude and crass things become. You’ll find a lot more farting in this edition. While all of this probably doesn’t sound interesting on the surface, when included in the film, these elements help fill out matters. The extra material gives us more of a feeling that we’re on the sub with the others. The impression of tedium and the resulting exhilaration when something breaks the monotony become stronger here, as the film expands nicely on those areas. The uncut take of Das Boot doesn’t reinvent the wheel, so there’s nothing here that will create a radically different impression of the story. However, the expanded version allows us to get a fuller feel for matters and it seems like the most satisfying edition of the film. 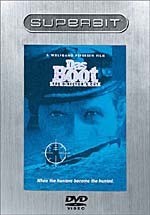 Das Boot appears in an aspect ratio of approximately 1.85:1 on these single-sided, double-layered DVDs; the image has been enhanced for 16X9 televisions. Better than the original release but worse than the Superbit, this version of Das Boot appeared flawed but acceptable. Sharpness generally seemed good. Most of the movie came across as distinct and accurate. A few shots displayed a less tight picture than I’d expect, but not to a great degree, and the film usually appeared to be fairly accurate. Jagged edges and moiré effects created no concerns, but I did witness a smidgen of light edge enhancement at times. As for print flaws, some small to moderate concerns arose. Due to low-light conditions, composite shots, and some apparent use of stock footage, the picture looked grainier than I’d expect at times. However, as noted, these issues seemed to stem from the original film, so I didn’t have any real problems with them. More annoying were other defects like specks, grit, small hairs, thin blue lines and marks. None of these ever seemed heavy, but they created more distractions than I’d like. Still, given the age of the movie, the flaws weren’t bad, and they became less prevalent as the flick progressed. The opening scene at the party looked worst, and once the crew went underwater, matters appeared noticeably cleaner. Das Boot generally featured a subdued palette, and the tones came across fairly well. The colors seemed restrained but accurate. I noticed only a few issues related to noise, bleeding, or other concerns, even during the occasional shots that featured red lighting. Mostly the colors remained nicely defined throughout the movie. Black levels were deep and rich, and shadow detail appeared acceptable. Some low-light shots – of which there were many – looked a bit murky and hazy. Ultimately, the picture quality of Das Boot showed concerns but seemed fairly satisfying for a product of its period. While Das Boot included a Dolby Digital 5.1 soundtrack, it definitely wasn’t the same one as the excellent mix found on the prior DVDs. This one still featured a pretty good soundscape, but it lacked the clarity and range of the other tracks. The soundfield was quite active for a release from the early Eighties. The front spectrum proved especially valuable, especially in regard to general underwater atmosphere. The track displayed a fairly good sense of place, with elements on the sides that added to the environment. The surrounds contributed a decent sense of place also, as they kicked in useful information. While I felt the track seemed more well-rounded than average for its era, it paled badly in comparison with the remixed audio for the Director’s Cut. The localization appeared much more general, as this one lacked the distinctive placement found on the newer mix. For example, check out the scene in which the bolts blew due to water pressure. In the Director’s Cut, you’ll duck as they seem to fly about us. You won’t get that feeling here, as the elements remain firmly stuck in the front and show no sense of dimensionality. Again, the soundfield was good for its era, but it remained lackluster and limited by modern standards and didn’t compare even remotely with the excellent Director’s Cut mix. Audio quality also suffered, as this DVD’s sound seemed somewhat muddy. Midrange dominated this murky track. Speech demonstrated acceptable intelligibility but was flat and without much life. Effects and music followed suit. They showed dull highs and boomy lows. The elements lacked much range, as they stayed stuck in a dense, thick tone between the two extremes. This made the auditory experience bland at best. Only a few small extras round out the package. We open with a six-minute and 15-second behind the scenes featurette that already appeared on the original DVD of Das Boot. Created to promote the theatrical release of the director’s cut, this program offers the standard mix of movie clips, shots from the set, and interviews. We hear from director Wolfgang Petersen, actor Jurgen Prochnow, and Ortwin Freyermuth, the producer of the director's cut. The featurette suffers from an overly promotional tone and its short length. Otherwise, however, it actually offers a fair amount of good information, and the smattering of material filmed during the shoot seems interesting. The featurette is a poor substitute for a real documentary, but it works better than most in the genre. In addition, we find some previews. This area includes trailers for the Director’s Cut of Das Boot, In the Line of Fire and Air Force One. Odd choice: DVD One only fills about 108 minutes, which means that DVD Two presents more than three hours of the movie plus the smattering of trailers and the featurette. The extra compression demands don’t seem to negatively affect the quality, but this still seems weird. Why not fill each disc roughly equally and spread out the film more? One other annoyance: when you rejoin the movie on DVD Two, you won’t jump right back into the action if you simply hit “play”. Instead, the disc shows a few disclaimers before the flick resumes. Didn’t we already see these on DVD One? Why provide them again? If you go through the chapter menu, you can skip these, but that step shouldn’t be necessary. While Das Boot will never be one of my favorite films, I felt the uncut full-length version found here worked best of the story. It expands matters nicely and comes across as fairly rich and satisfying. Picture quality and audio were flawed but acceptable for a product of the early Eighties, but the set included only some minor extras. Recommendations become difficult due to quality issues. Picture quality seemed similar to prior versions. The visuals fell short of the Superbit DVD, which looked best, but were moderately superior to those of the original 1997 release. However, both of those offered excellent 5.1 audio, whereas this one’s multichannel mix seemed only slightly above average for its era. Clearly the Superbit DVD provides the strongest mix of audio and video quality. This uncut release of Das Boot gives us the best version of the film but it features the weakest overall level of quality, largely because the audio seems radically inferior. As much as I like the uncut version, I’d still recommend the Superbit DVD for most fans just because it offers the highest quality release.